The boutique hotel Villa Caemilla has a beach-facing bar that’s perfect for some serious relaxation. This peaceful beach-front bar is perched on the white sands of Boracay, an idyllic island in the Philippines. It’s part of Villa Caemilla, a boutique hotel whose Dutch owners pride themselves on their hospitality and flexibility to holidaymakers’ needs. You can choose to enjoy your drink indoors, at the well-appointed bar that’s styled with tropical bamboo. But with the sea on your doorstep, it’s even more tempting to enjoy a tipple outside on the hotel’s private beach. Friendly, hardworking staff take orders directly from outdoor sun loungers – the perfect place to relax and watch a ravishing sunset. The cocktail menu includes bright, sun-loving favourites like Holy Water, a blend of fresh celery juice, mangosteen-infused gin and lime that slips down easily on a hot night. 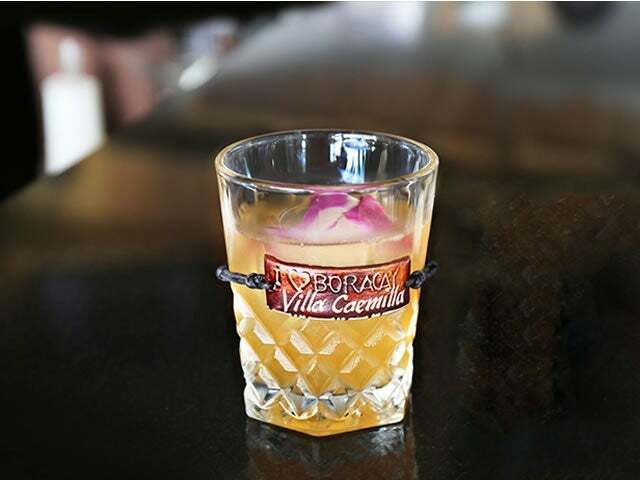 Other offerings take their inspiration from Boracay’s local folklore, such as the Juan Tamad – a rum, coconut and chocolate blend that’s named after a mythical character who’s famed for his extreme laziness. The bartenders are keen to tell the stories behind their creations, and to throw in the odd flourish of showmanship with flames or smoke. Villa Caemilla also takes inspiration from its tropical setting to offer a wide menu of freshly prepared juices and smoothies – as well as thoroughly Western Illy coffee, for anyone in need of a pick-me-up that’s closer to home. With daily happy hours, live bands every night, and gorgeous views out over the seafront, this bar promises fun and relaxation in equal measure.